Hi there, blog friends! 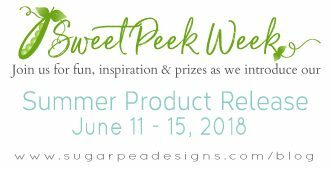 Welcome to day 4 of the SugarPea Designs Summer Sweet Peek Week! We've got a ton of amazing new products to share with you, plus lots of inspiring projects! 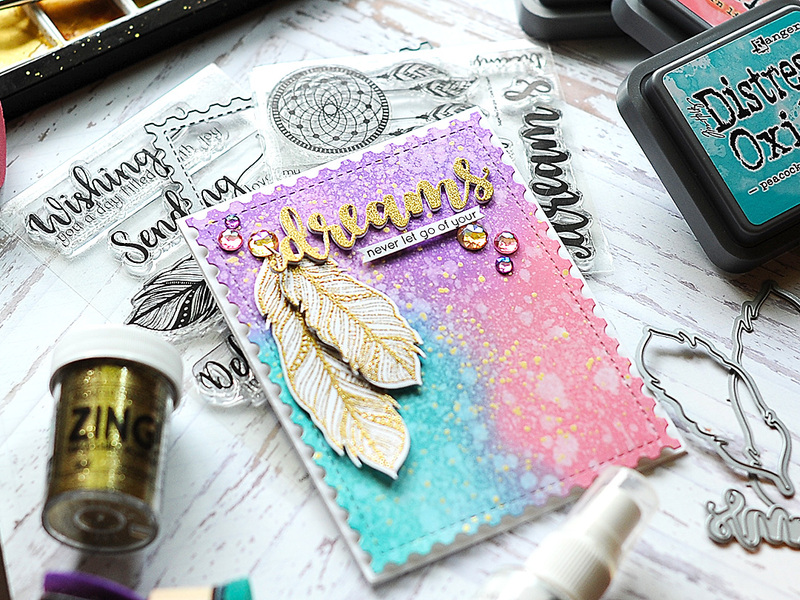 Today I am featuring the following items: BoHo Feathers stamps & dies, Dare to Dream stamp set & Dream word die. 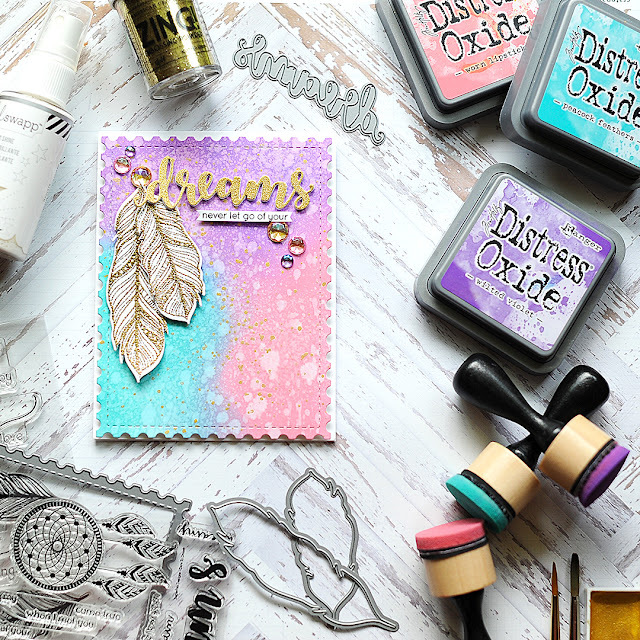 I love the dreamy colors, and they felt fitting for the theme of these new stamps & dies. To start I cut an A2 card from white cardstock, then set aside. Next I cut a block of cardstock the same size & blended Distress Oxide inks to it in the following colors: Wilted Violet, Worn Lipstick & Peacock Feather. Then I spritzed it with water & picked it back up with a paper towel. Finally, I sprayed it down with white shimmer spray and flicked gold paint splatters to the front of it. Then I set it aside to dry. Next I stamped & heat embossed the feathers in gold glitter powder, and cut them out with the coordinating dies. 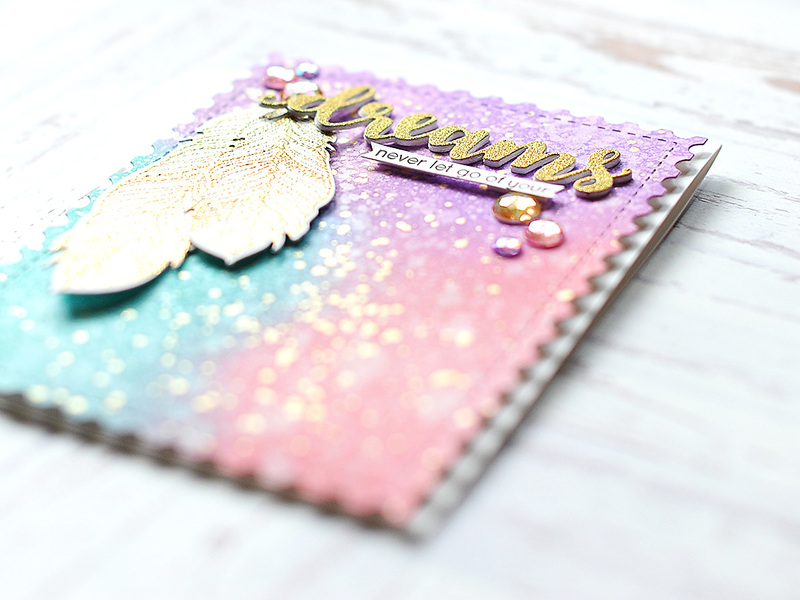 Then I diecut the word DREAMS four times: once from gold glitter paper and three times from white cardstock. I layered them together using a Zig glue pen, then set aside. Finally, I stamped the rest of the sentiment in onyx black Versafine to white cardstock, and trimmed it into a thin strip. Then it was time to put the card together! I mounted the ink blended background to the card front with foam adhesive. 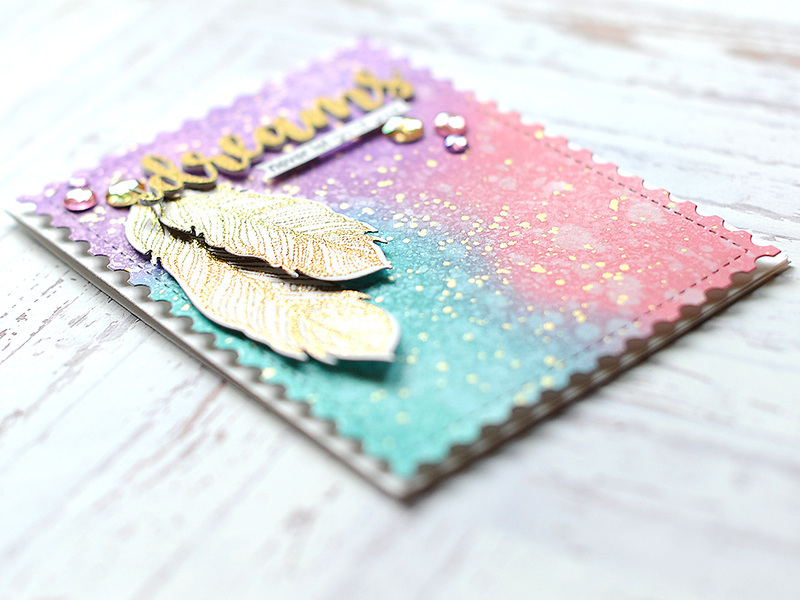 Then I adhered the feathers to the left side of the card using both mixed media glue & foam tape. Then I added the word DREAM across the top, adhering it down with mixed media ink. 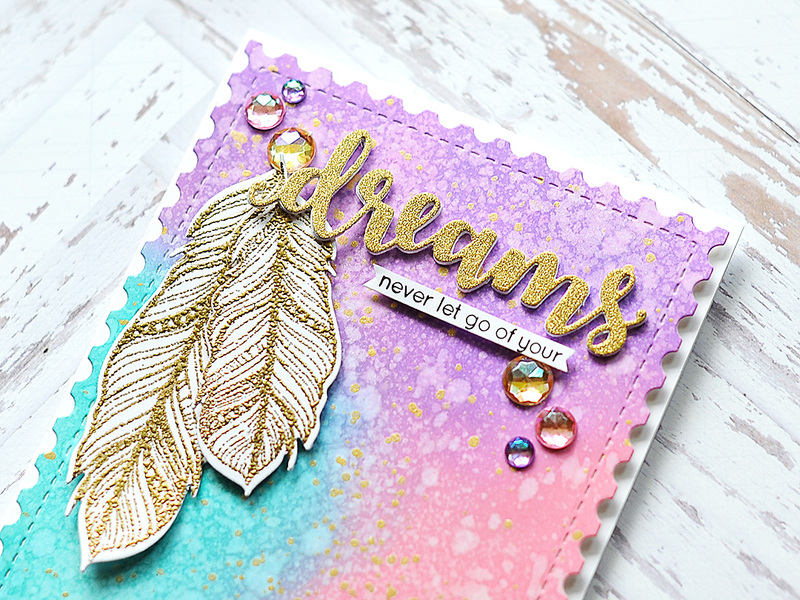 Then I added the rest of the sentiment directly below the word diecut, and accented the card with my signature jewels tucked here & there. I wish you could see the shimmer better on this card...it is SO pretty in real life! It just doesn't photograph very well. such a pretty design Lea! Beautiful and dreamy! Love the background paired with the feathers! Beautiful card. Your background is absolutely gorgeous. Very pretty and elegant. Gorgeous BG colors. 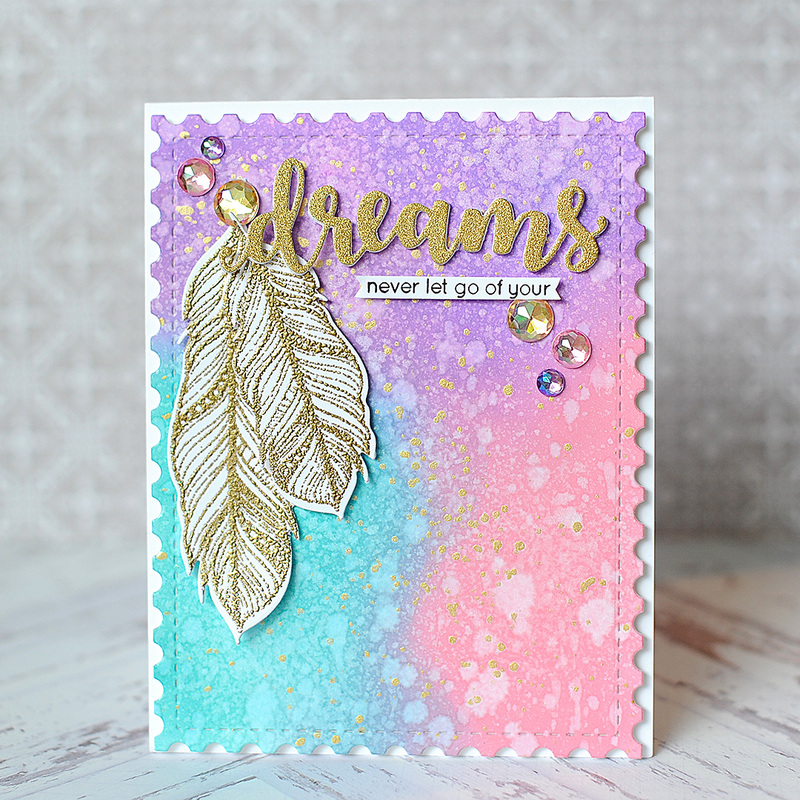 Another gorgeous card--so elegant and lovely colors. 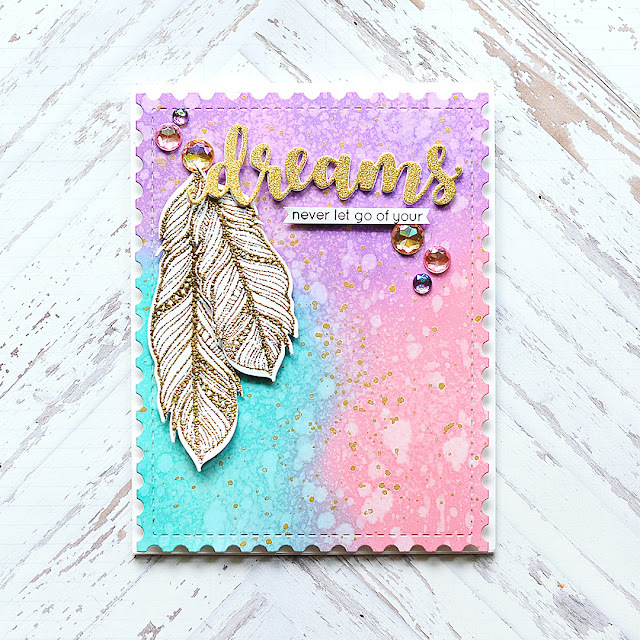 WOW, fabulous background and the feathers are stunning on it. Beautiful background on your sweet card! THIS IS FABULOUS! My favorite so far! The colors the gold speckles WOW! The colors are so pretty, and I love the spots. Nice job. 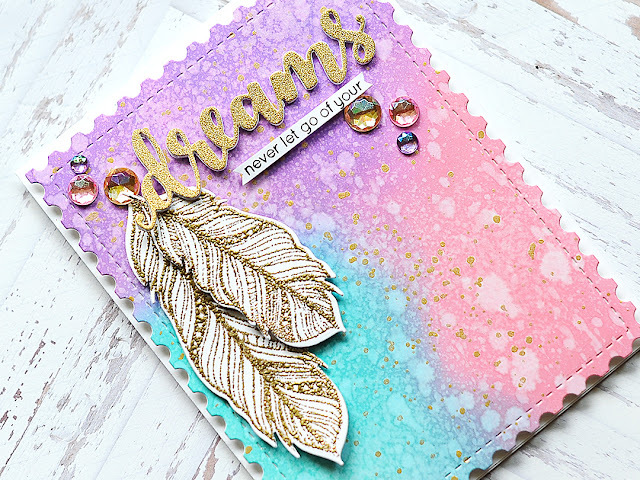 Fabulous card! I love your design and such a stunning background! As always your backgrounds are amazing!! Lovely card!! Beautiful card with dreamy colors! Absolutely stunning. I love the soft colors, it looks so pretty. Stunning card! Love the background. 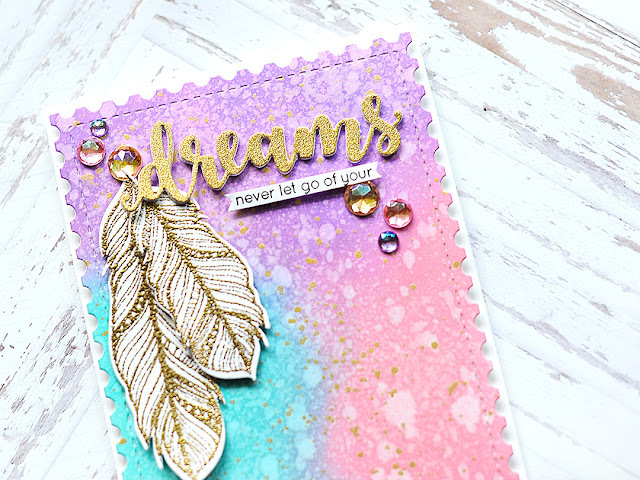 Wow this is so pretty..the background lets those feather really stand out. Again today, you’ve made a truly magical card !! 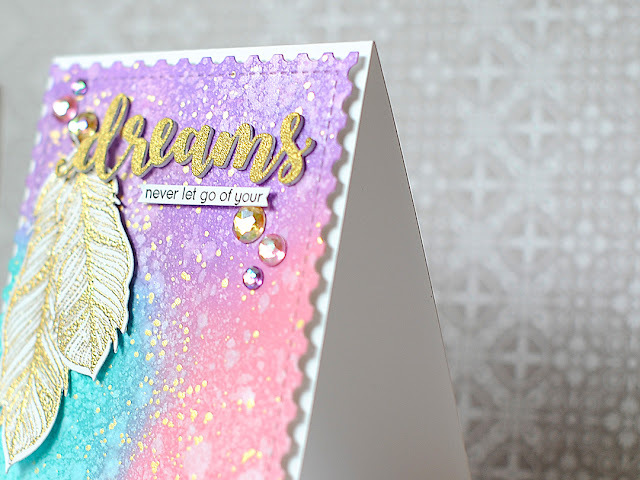 These blended colors are so soft, that’s stunning !! Sparkle, shine and fantastic colors - fabulous!